Honestly, are all the planets in alignment for Obama this year or what? The latest developing news is that David Souter is pining for his home in New Hampshire, and wants to retire at the end of the current court term in June. This would mean that Pres Obama gets his first chance to make his own nomination to the Supreme Court. PolitiFact is a project of the St. Petersburg Times to help you find the truth in American politics. Reporters and editors from the Times fact-check statements by members of Congress, the White House, lobbyists and interest groups and rate them on our Truth-O-Meter. Weâ€™re also tracking more than 500 of Barack Obamaâ€™s campaign promises and are rating their progress on our new Obameter. People Magazine has come out with its annual 100 “most beautiful people” list. Among these people is a list of “Barack’s beauties”. No, I’m not making this up. Stop laughing. People magazine is a highly respected source of information. Among those making the “BB” list is none other than SECTREAS Timothy Geithner. So, I have a question for the fairer side of the PD spectrum: Given the population in question, would Geithner make your Top 100? Tonight, for the third time in the 100 days of Team Obama, The One will pre-empt prime time broadcast time to talk to the American people about his favorite subject â€“ The One. ABC, NBC, and CBS have dutifully thrown out their scheduled broadcast material for the 8:00 Eastern timeslot. So, for those of you needing your fix of Scrubs, Better off Ted, Rules of Engagement, New Adventures of Old Christine, or a rerun of Law & Order, youâ€™re out of luck. These episodes have been sacrificed for the good of the country â€“ or for the good of Obamaâ€™s public image â€“ whichever one you think most important. Fox, however, has refused to participate in Obamaâ€™s nostalgic look back at his 3 1/3 months in office. They came to the conclusion that airing the drama Lie to Me would make more sense. Better to earn some ratings cash than to listen to Obama take four questions, talk for an hour, and say absolutely nothing while looking good doing it. Either that, or they figured the showâ€™s title would best fit the content of an Obama press conference. The aftershocks are still rippling, and the analysis is just beginning, but the defection of Arlen Specter is certainly one of the most interesting political stories since the election in November. Most critical to the Republicans is the potential for a filibuster-proof Senate (if Al Franken gets seated) for the first time since the late 1970s. Beyond the short-term, there is the future. Specifically the 2010 midterms, when Pennsylvania is sure to be one of the most closely-watched battlegrounds. Specter will undoubtedly get support from the White House and the PA Democrats, which makes his path through their primaries look reasonably clear. He will face a young, up-and-coming Democrat by the name of Joe Torsella, who has long been considered a favorite of PA guv Ed Rendell. Rendell is also friendly with Specter though, which could lead to Torsella’s anticipated support from Harrisburg to evaporate. This isn’t terribly newsworthy except that it made me happy. And I like to be happy. Nancy Grace beat K.O. in the ratings. Yes, that Nancy Grace. I wonder if she’ll be the World’s Worst Person tonight? HLN’s Nancy Grace topped MSNBC’s Countdown with Keith Olbermann at both 8pmET (411K vs. 384K) and at 10pmET (275K vs. 225K) in the A25-54 demo. For its first run at 8pm Grace was up 103% in the demo and up 88% in Total Viewers â€” the most growth of any cable news program in its time period. Olbermann topped Grace in the hours in Total Viewers. FNC’s O’Reilly Factor was #1 in both categories. HLN also showed growth in every hour of the day (Mon-Fri) in April – up 49% in A25-54 viewers and up 32% in Total Viewers. When I was younger and much more reckless in my political thought, I thought that having a President and a Congress from the same party was a good thing. After seeing the mess that GWB and the GOP made of things in the mid-2000s, and what the Dems and Obama are doing now, Iâ€™ve changed my tune. I have to say here, that Eddio beat me to the punch with this blurb, but I must opine…. This just in: Breitbart is reporting that Arlen Specter has done some soul searching, and he is now making plans to switch parties and become a Democrat. And more to the point, will it help him get re-elected? Mustang, mustang this is Ghostrider 203. Request permission for a flyby, over. Memo to The One: Its 10 am. Do you know where your backup jet is? Personally, I’ll cut Barry some slack here. I’m sure he just wanted it to look like he was personally conducting Combat Air Patrols over the Big Apple. Artist Michael D’Antuono’s painting “The Truth” â€“ featuring Obama with his arms outstretched and wearing a crown of thorns upon his head â€“ will be unveiled on April 29 at the Square’s South Plaza. Either way, this imagery frightening and sacrilegious to the highest degree. 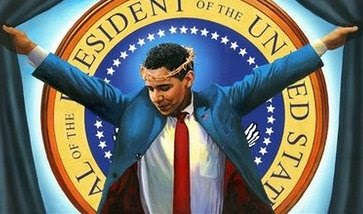 If Obama were a true believer, don’t you think he would ask for this painting not to be displayed? Exclusive guest submission from Myra Adams. Enjoy. Itâ€™s always entertaining to watch surreal news stories intersect. In one corner you have The Taliban, the scariest people on earth, (except for that Texas cult with the pastel colored prairie dresses) about 60 miles from taking over Islamabad, Pakistan, infamous for its nuclear capability. While convalescing from my recent injury last month, I read with great interest a piece by Michelle Maulkin concerning the tragic accidental death of Natasha Richardson while skiing in Canada. Maulkin makes a case that the nationalized health care system, or Canadacare, let down the Richardson family in their moment of need. Am I the only one who wishes Meghan McCain would just go away? Hasn’t it been 16 minutes already? It has often been said that the political process is much the same as that used in the production of hot dogs. Most everybody likes the hot dog, but nobody wants to know just exactly how they are made and even fewer care to know the exact ingredients. The same thing could be said about the shadowy world of the clandestine service. The Intelligence Community of the United States Government â€“ made up of several three-letter acronym agencies â€“ has been given the very difficult mission of spying on the worldâ€™s terrorists and extracting information from them when weâ€™re lucky (or good) enough to catch one of them. In the aftermath of September 11, a premium was placed on intelligence information gathered from captured terrorists. The President, and Congress, ordered this nationâ€™s intelligence apparatus to gather any and all information from all possible sources in order to prevent another terrorist attack on American soil. I know this program alone is worth more than the FBI, the Central Intelligence Agency and the National Security Agency put together have been able to tell us. It’s been a long time since I’ve seen Hillary story with so much potential for ridicule and snark. Let ’em fly! WASHINGTON (CNN) – Secretary of State Hillary Clinton made an unusual comparison Wednesday during remarks that celebrated Earth Day. Clinton observed that the State Department was “mixing messages” by using candy to entice employees to visit exhibits showcasing the agency’s energy-saving projects. If you werenâ€™t scared by some of the things Pres. Obama is proposing and saying, you should be now. At the beginning of April a bill was introduced in the Senate (by Rockefeller D-WVa and Snowe R-ME) that would give Mr. O the power to shut down the internet in case of a â€œcyber emergencyâ€. I know youâ€™re asking yourself, what would constitute a cyber emergency, and why wouldnâ€™t any sound network already have safeguards in place for an emergency in the first place? Any company that is worth its salt already has a plan, and has no need for this type of government intervention. And here is where I would like to share my housewife genius with Mr. Obama â€“ free of charge, because Iâ€™m nice like that. Generally if a product stinks, people wonâ€™t buy it, or consume it or use it, and they will tell their friends. So, itâ€™s in a companyâ€™s best interest to put out a quality product. This is how the free market works; quality wins, and if an ISP does not put out a quality product â€“ a safe product, people will go elsewhere for their internet needs. In fact, I will go as far to say that the private sector is probably better protected and prepared for a cyber emegency than the public sector right now. The reason is again, because, itâ€™s in their best interests to be so. I was thinking in the shower today (I do that occasionally – shower, that is) about the last 10 years. I wondered while I lathered what the rallying lightning rod was that kept most liberals around and coordinated with each other over the last 5-8 years. It kept coming back to the war in Iraq. That, more than anything else, seemed to be the bigger compelling vision that Dems used to smooth over the natural divisions present in the Dem party and with various liberal factions in the US. So here’s my question: What happens after Iraq? What happens to the liberal coalition after we pull out of Iraq with only a token force retained for special ops, and leave the daily governing and security to the Iraqis? What happens when Iraq disappears totally from the news, and from the daily concern for our troops, who will be all home? Has it been just 100 days? On April 29th the clock will run out on Team Obamaâ€™s first 100 days in the White House. Iâ€™m sure the MSM will commemorate that day with a non-stop, wall-to-wall frat party extolling the virtues of the fact that Hope again fills the hearts and minds of Americans for no other reason than their guy sits in the Big Chair. It will take a lot of whitewash to paint over The Oneâ€™s lack of significant accomplishment during this arbitrary 100 day time-span. Iâ€™m fairly several events won’t make an appearance in this media feel-good fest. No mention will be made of Obamaâ€™s plan on what to do with the terrorists currently housed at Guantanamo Bay after the prison is shut down. Where will they go exactly? Well, very good question that has yet to be answered. There is, of course, the option of releasing them into the general population of the United States complete with a welfare check. No, Iâ€™m not making this up. I wish I were. While the MSM will no doubt trumpet Obamaâ€™s â€œsuccessesâ€ related to foreign policy, they wonâ€™t mention his lack of tact â€“ let alone forethought â€“ in dealing with Americaâ€™s premier ally in Europe. It was almost as if UK Prime Minister Gordon Brown showed up unannounced at the White House door and Barack and Michelle had to send their two daughters rummaging through their DVD collection to find something to give Gordon on his way out the door. Never mind the fact the DVDs wonâ€™t play in London. Itâ€™s the thought that counts. Remember this from just a few weeks back? Well. It seems as though the “great civilization” of the Islamic Republic of Iran, in a closed door kangaroo court, has sentenced an Iranian-American reporter, Roxana Saberi (31) to eight years in prison. The sad part is that many Americans will try to create a moral equivalency of the Iranian process to that of Gitmo, thus, ignoring the obvious differences of not having proper papers to that of shooting at American troops on a battlefield while proclaiming a return to Jihad upon release. President Obama’s naivete is beyond laughable, childish and weak. It is dangerous. He is basking in the glory for giving the command to take out of three pirates all the while apologizing to the world and extending the olive branch to every thug dictatorial regime in his path. Europe loves Obama’s approach to world affairs as it comes directly from the European model. Unfortunately, America’s enemies must be loving it and laughing at it as well. Would the Iranian courts have arrested and come to the same result had Bush still been in power? Probably. The difference is in the fact that the Bush Administration would not be on the world wide web telling the “Iranian leadership” how respected they are and how much we appreciate their great contributions to the world community. But. It doesn’t really matter because there is no difference between a Republican administration and a Democrat administration, is there?